This isn’t really a review of the Traveler’s Notebook but rather a piece on how I use my Traveler’s Notebook. 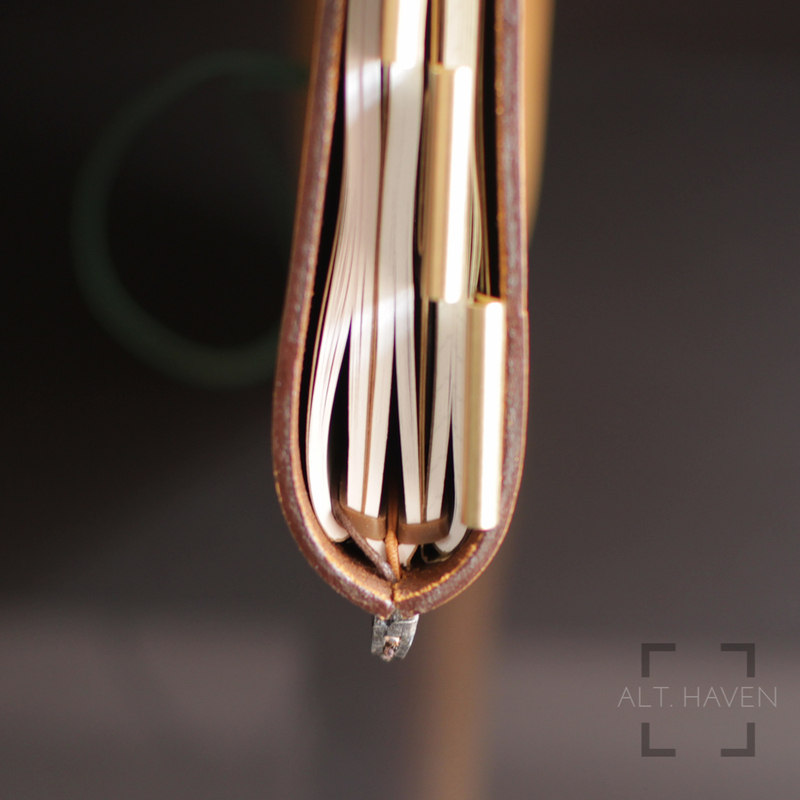 If you are looking for a review, check out the guest review of the Traveler’s Notebook here. 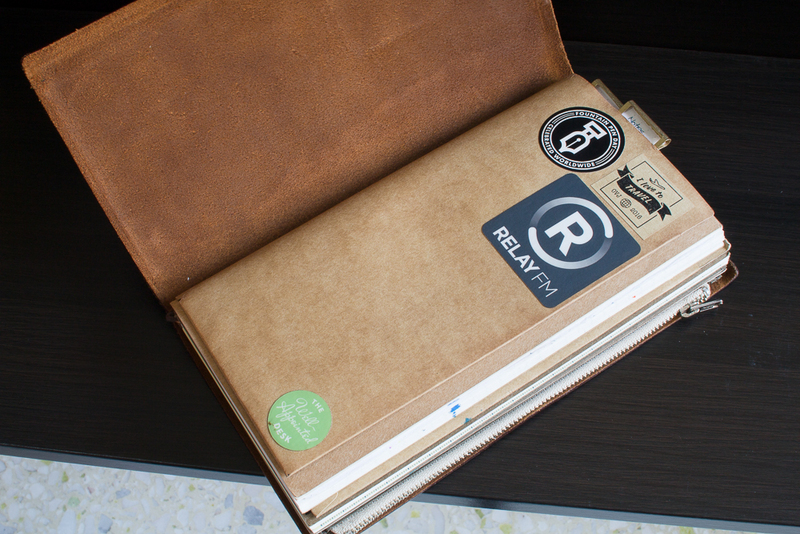 It has been 4 months since my initial purchase of the Traveler’s Notebook in Camel from Amazon Japan. Yes I knew it will be available in Singapore eventually but I just couldn’t wait. After my foray into the world of Hobonichi and various leather covers for it (Roterfaden Taschenbegleiter and Astrida Leather cover), I found I didn’t like the weight of an A5 notebook plus a leather cover. I made the switch over to the Traveler’s Notebook as my everyday planner. Happily I picked up a number of refills and accessories for it. After 4 months of experiments, I am quite sure that this is my setup going forward, for the rest of the year at least. The Camel leather scars and ages really easily. Though it has only been 4 months, it looked as if my Traveler’s Notebook has actually been through a lot. Though I must admit, it was soaked in water when my water bottle spilled it’s contents inside my bag a number of times. There were ink splatters and I didn’t baby it in the slightest. The barcode charm on the exterior was picked up from a Malaysia based online retailer, Stickerrific. I had initially wanted to keep the exterior plain without adornments but I found having a charm makes it easier to find the elastic band and pull it down to unbind the cover. 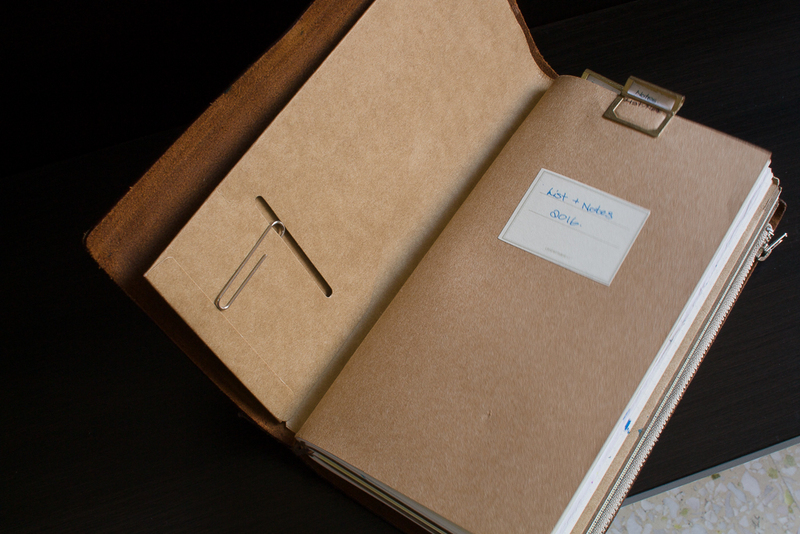 First up is the kraft folder that holds all my loose paper such as receipts and the like. The folder also takes all the stickers that I’ve saving up, saving up for what purpose I have no idea so on they go. At least the kraft folder stays in the cover and won’t be switched out, so I get to enjoy my stickers. Then, my first notebook is a lined one. It holds all my lists and notes. It is barely filled at this moment. 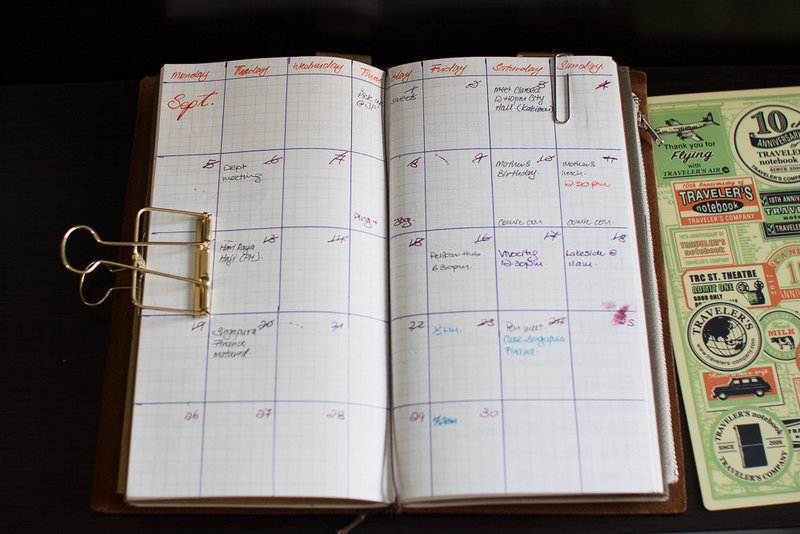 I use it to keep track my blog ideas and ink review progress. Sometimes it also double up as my ink testing notebook. I spilt it up into 3 portions the front contains my lists while the middle my notes about pens I am reviewing and the back my ink testing. After the refill is the other end of the kraft folder where I keep different paper samples folded down to fit. That way if I have a pen or ink to test on the go I have Tomoe River and Rhodia paper handy. My second notebook comes after that. It is a grid notebook that holds my bullet journal. I don’t have a dedicated monthly refill instead I just draw my own. I want everything to be altogether in one refill and not spread out into two different refills. (Though I’ll be experimenting with this next year since I’ve purchased a 2017 monthly refill.) This is my most often used refill and I run through one refill in 3 months that’s why I have it in the middle for easy removing. I have my monthly calendar, weekly tasks and daily bullet journal all in just one refill. After that is the fabric zipper pouch by fourrouf. This is available exclusively from Traveler’s Factory though you can find some sellers on Etsy reselling it. Thought Traveler’s Factory only ships within Japan, you still can purchase directly from Traveler’s Factory, all you need is Google Translate and Tenso. I am glad I picked the olive green one. I had another canvas card holder previously but the leather turned the white canvas into a light brown. With the olive green fourrouf it isn’t obvious if something similar is happening to it. In the larger pocket I keep some random stickers that I haven’t been able to bring myself to stick them on something. I keep some discount cards and the like in the card pockets but I hardly use them. The cards also keep falling out. It is rather annoying. My third and final notebook is a blank refill. It acts as my ink journal. I don’t really need it to be with me on the go but it is useful to have that as a reference. That way I know what ink is in which pen. And finally, there is a large zipper pocket that’s the other side of the fourrouf pouch. I keep random knick knacks inside. 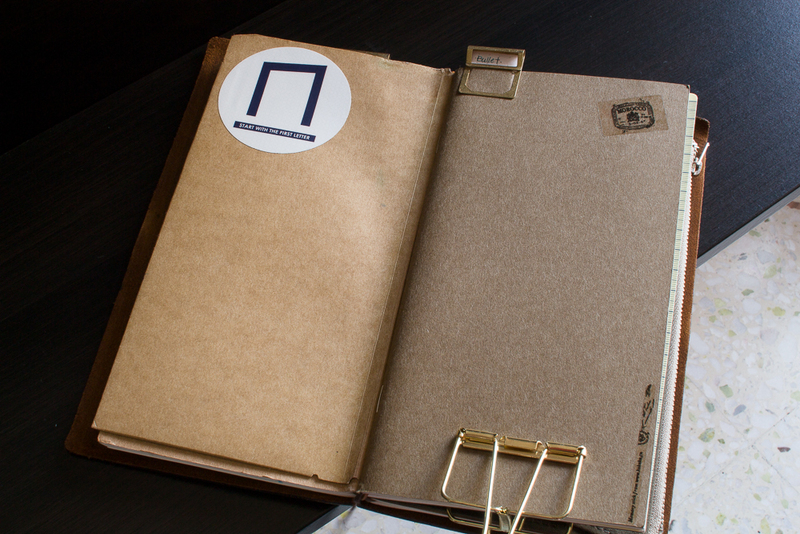 I use Traveler’s Notebook brass index clips to label my notebooks on the top. I do not really need to do that but I thought it looked nice with the brass clips. I also have a pencil board that acts as a bookmark in my bullet journal. I have an index card that has been cut down to size to act as an ink blotter too. I had a pen holder too but I found it was difficult to pull the pen in and out of the pen holder. That’s my setup. It isn’t the most compact one out there but it isn’t the most massive one too. I think it is of a nice size that makes it nice to have in the hand. I enjoy the Traveler’s Notebook’s versatility. It is as thick or thin as you need it to be and it has plenty of stickers, charms, bookmarks to deck it out with and show the world your personality. Special Note: I did also purchased a Passport size Traveler’s Notebook but I found it mostly lay unused at home. Thus I’ve decide to sell the entire set. However you can still enjoy the photos I took of it when it was brand new.